The Ace VIP offers the best Mykonos luxury villa, suitable for every type of holiday you are planning even if it is a celebration, party time or family time type of trip. We provide villas in more than 32 different locations in Mykonos. Would you like a villa in the city center or something more private with a private beach and a dock? Mykonos villas are ideal for stylish and luxury parties as well as memorable events and experiences. Enjoy a romantic evening at one of our extravagant villas and mansions with a breathtaking view from one of the best locations at Mykonos. Get to spend a vacation in a dream like villa and have the time of your life with family and friends. Check our Frequently asked questions about villas. Mykonos is an ideal place for vacation and we will make your trip more memorable as we will provide you with the most exclusive and executive places to stay in. Connected to beautiful beaches, clear blue waters, luxury pools and a splendid bird’s eye view of the extraordinary city, our Mykonos luxury villas will make the most of your trip an enjoyable and memorable experience. Once you stay here, you will get to know why people love visiting this island. Relax and lay by the pool side as you enjoy a peaceful, quiet and romantic day in the best beaches of Mykonos. Not only this, but we will also provide you with amazing cuisines prepared by professional chefs to let you relax furthermore. All weathers can be enjoyed here in Mykonos Greece with the most comfortable tourist experience. It will feel just like home. Rent villas in Mykonos Greece for the best experience possible. Almost all villas have private swimming pools to further enhance the enjoyment of your stay. Pool terrace and sunbath areas with sun beds will make you feel like relaxing at a spa. An elegant outdoor sitting is luxuriously set up with sun beds and sun loungers for a resort like experience; relax and bathe in the sun whist you read a magazine or listen to music with a breathtaking Aegean sea view of the beautiful island and its exceptional scenery. Every villa has a space for parking vehicles and is secured with high security. All the large double bedrooms have an attached suite bathroom with all services and equipment such as hair dryer, TV, A/C, kitchen electronics, Wi-Fi, bath amenities etc. Enjoy taking a bath in outdoor and indoor showers with amazing water supply, Jacuzzi and water heating system. Spa Treatments, Massage and Beauty Services can also be provided to you with our expert beauticians. The villa has a connected wide paved area outside that is attached to a huge swimming pool with clean turquoise clear water; it captures direct sunlight for an exceptional sun bathing experience. The architecture of the villa has been specifically designed from the best architects, and its exterior has modern as well as traditional Greek designs with fresco or stucco pillars and wide steps for the guest’s enjoyable stay. Many of the villas have barbecue stand constructed with stone and a long marble table. It can give a great outdoor activity experience. Some of our villas are voted among the Best Mykonos Luxury Villas in the Mediterranean Sea. Convenient services include daily cleaning service that will not disturb the people living in the villa and will be completely discreet. Sheets, towels and linen will be changed from week to week which will also ensure quality housekeeping services with check in and check out procedures. The house keepers will fresh the pool water every day for a clean and hygienic living. Requests can be made on a broad perspective as you can order groceries and maintain the kitchen without any hindrances. A private chef will be provided to each villa which is another bonus and comfort, he will prepare delicious meals for the house members every day to keep them out of trouble for ordering or dining out when not needed. The Ace VIP is an exceptional villa collection service where you can find all things in one place. Rent a car, helicopter or yacht for exploring the beautiful island of Mykonos; you will not miss out on the extraordinary sceneries and tourist attractions if you travel with us. Not only for exploring, but the Ace VIP will take you to fun activities like water sporting and boat riding. If you are traveling with family and friends you will have the time of your life with no moment wasted. We will turn your vacation into the most amazing life experience. 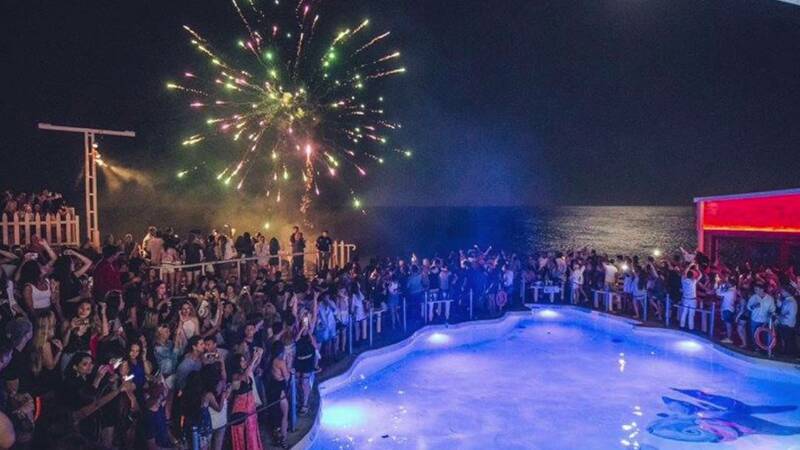 People go to Mykonos as an escape for the summer. You will not want to go back once you get to see the breath taking beauty views in the Aegean sea that Mykonos has to offer. The villas that we provide are so luxurious and comfortable you will not want to get out of bed and explore town! Take a seat on a plush couch and be provided with refreshing cocktails as you enter. You wouldn’t even need to dine out with our savoring and mouthwatering food cooked by international expert chefs. For choosing the perfect villa in Mykonos, keep your most preferred place in mind as we have a variety of villas in different places for example perched on top of a hill, near a beach or on in the middle of the main city. Choose your pick and we will provide you with what you desire. Our villas in Mykonos are specially constructed and designed for a relaxing experience that will make you feel at home and give you the most memorable experience of your life. The Ace VIP team will help you find the best villa for you in Mykonos, which has all the features you are interested in. We will treat you like royalty with our exceptional services as you start your vacation. Our villa collection is mostly located on Mykonos best beaches; they are located in such a place that will give you an independent and free living. If you are looking for a luxurious villa in the heart of Mykonos then that can also be provided, other houses are located close to the city with hardly a 2-4 kilometer distance. The locations are ideal for tourists with a less crowded and less noise polluted area. Our wish is to offer you a pleasant and relaxing stay, we are always at your service to provide any type of information or suggestion you want. You can book your reservations a few months before your stay any time you think necessary or whenever you feel comfortable. You can contact us on our email or number to choose the best villa. Explore a variety of houses and villas available for rent and make your trip to Mykonos the most memorable of all. Mykonos is famous for its beaches and if you love spending time at the beach then this might be just the place for you. 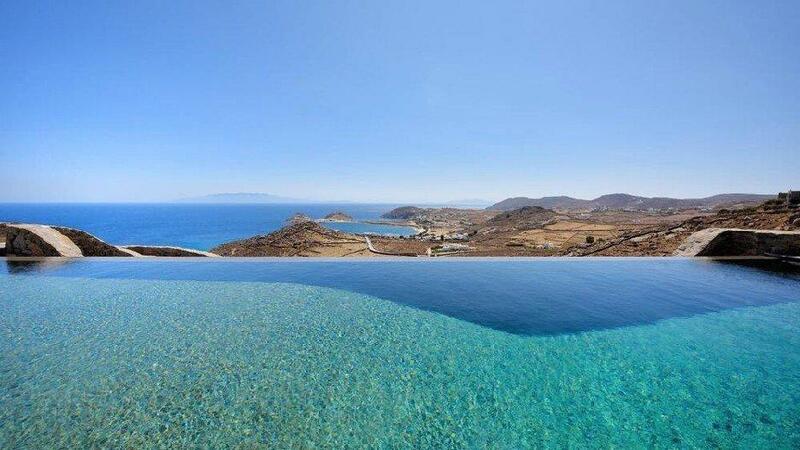 We will provide you with amazing villas that are located next to Mykonos’s best beaches. Sleep with the rhythm and sound of the ocean and take long night walks on the shore. These beach villas are perfect for spending time with your significant other. Get an experience of walking on the coast of Psarou beach and Paradise Beach as it is a known highlight for visiting Mykonos. The beaches in Greece are different than beaches in any other place. With its clear turquoise water and clean environment, you will be able to take a breath of fresh air, especially if you are traveling from a loud city environment. The beach water is amazingly clear and great for swimming. For a relaxing moment of sand worthy experience, get a peaceful and quiet contemplation by taking a walk on one of these rent villas Mykonos beach. If you are thinking of gathering all your friends for a luxury holiday to remember, The Ace VIP is the best option for you. Our villas for large groups in Mykonos are available for arranging big parties and events for your special occasions. Weddings, anniversaries, bachelor and bachelorette parties, engagement parties and many others you desire can be held here. We can provide villas with 10 bedrooms or more so all of your friends can fit comfortably on the same property. Also, if staying in the same villa with all of your friends or family isn’t what you are looking for and you would like more privacy, we have villas with guesthouses to make this holiday according to your wishes. We can provide a Villa for your special event. They come in every range and size with numerous rooms as many as 17 and as less as 3 according to your needs. Private events such as celebrations, birthday parties, weddings and business gatherings can be organized. Features of our villas are perfect for those luxury events. Most of them have lounge areas, private pools and private parking areas with A/C in all rooms. Choose the appropriate size for your need and book your stay right away! Special deals and management for your events can be arranged. Many celebrities, politicians, famous people stay at our luxurious villas for their short visit or long term stay. We are strictly careful about our client’s information and keep their visit discreet. The Ace VIP has exceptional customer service and we never let our clients down. No client has ever complained of poor quality or bad service as we take careful measurements and precisions to keep them happy. The life in Mykonos is full of glamour and style as all people love to enjoy parties and formal events at luxurious villas or mansions. They prefer spending their lifestyle amongst the colorful lives of celebrities and artists. We have just the place for your needs as all our villas are highly extravagant and posh for any reservations. All villas are near to airports with a distance of not more than 3-5 km. The Ace VIP has its own luxury car rental service which can accommodate with airport pick and drop as well as luggage carriage. We can also provide you with traveling and the best tourist experience; do not miss out on the highlighted areas of Mykonos as we will take you to the best attractions and restaurants for the experience of your life. You can trust us with all services and put your feet up and relax for the entire vacation. The Ace VIP team will help you find the best villa for you in Mykonos, which has all the features you are interested in. Our wish is to offer you a pleasant and relaxing stay, we are always at your service to provide any type of information or suggestion you want. How does the booking process work for villas? First contact us via email at legends@theacevip.com or reach out to us by phone or Whatsapp on +306943195090. Kindly let us know which villas are of interest to you as well as how many people there are in your group (including children) and the exact check-in/check-out dates. Prior consent is required for pets. It would be great to know if you have any additional preferences or requests like fridge stocking, alcohol preferences in the villa or other requests. We will email you with available options and rates. Upon confirmation from your end, we will reserve the villa for you by placing a 3-day hold. Then we will provide you with payment options and details. Every villa requires a security deposit which varies by the size of the villas. Once we receive an advance payment from you (30-50% of the total + security deposit, then you are confirmed. The security deposit will be returned to you upon a successful check-out. For villa rentals we require only one passport, which needs to be of the signee. Cancellation policies for Villas varyfrom villa to villa. It will be specified in the rental agreement that you receive from us but generally speaking, there is a 0% refund for cancellations that take place approximately 1 month before the check-in date. We accept payments by debit card, credit card and bank transfers. Should you need to withdraw money for your own personal expenses in Mykonos, you will find a lot of ATMs on the island. Further, Wi-Fi and Internet in Mykonos is steady and relatively fast, allowing you to conduct e-Banking and m-Banking transactions from your device. Do you provide villas for large groups? Our largest villas can accommodate up to 32 guests. Is there a minimum stay for your villas? Most of our villas have a 7-day minimum but do not let that discourage you. We also have a lot of properties that do not have a one-week minimum. Which areas in Mykonos are least windy? The South Coast of Mykonos is least windy. This includes Agios Ioannis, Ornos, Paraga, Agios Lazaros, Psarou, Elia and Super Paradise. Do you provide villa-share or time-share options? No, The Ace VIP does not provide options for sharing villas between different groups and clients. What staff is included in the villa? Only daily maid service is included. If you require a private chef, butler, waiters, security or babysitters, please inform us at your convenience. What are the Check-In / Check-Out Times for Villas? Check-In Time: Depending on the villa, Check-In time is either 2:00 PM or 3:00 PM. Certainly you can arrive later. A representative will be in contact with you to coordinate a smooth Check-In. This representative will provide you with your keys and house rules. This representative will also conduct your Check-Out process and will help you out if you run into any problems. Check-Out Time: 11:00 AM the latest. Why do rates vary so drastically across the season? Rates for villas vary greatly by seasonality. Although Mykonos is a summer destination operating from April until November, the most popular time to visit Mykonos is from July 1st until August 31st. That is when everyone rushes to the island and books everything they need. There are a lot of guests who pay extremely high rates for hotel rooms and villas just to be present in Mykonos during this time. The most expensive time to be in Mykonos is during peak week which is the last week of July. We highly recommend you consider visiting Mykonos during June and September because you are bound to get better rates for rentals and services during those months. What happens when major issues arise with the villas? During peak season, some parts of the island will experience power outages and water shortages. The Ace VIP is neither responsible nor liable for any faults with the villas including breakdowns of mechanical parts, water problems, swimming pool filtration, power outages, gas or other. If such an occurrence rises, The Ace VIP will investigate into the matter and invest a maximum effort into getting the problem solved. If the problems still persist, then The Ace VIP will look into other solutions including change of property and refunds. Further, The Ace VIP assumes no responsibility for accidents, injury, death or loss, including consequential damages from the rental and use of its properties. As a precaution, do not leave children unattended in the pool of your villa. What are the rules for organizing parties and private events? Small house parties are generally allowed in villas as long as the guests can upkeep a safe and clean environment without any damages. A lot of properties have strict rules regarding bigger parties and private events which include an extra fee for holding parties with limitations on the exact number of people that can attend and allowed noise hours. There are a lot of properties that have neighbors which will not tolerate noise or loud music at any hour which will make them call the police to close down the party. Generally, quiet hours are between 14:30-18:00 and 23:00-08:00. The Ace VIP is here to assist you with the complete organization of your private event. Upon agreement with the property owner, we will provide you with speakers, lighting, DJ, performers, security staff, catering, alcohol and anything else you may require. As a precaution for event safety we insist on at least 1 security staff per 15-20 guests for a safe and fun party environment all throughout the night and so that there are no uninvited guests.